Crinkle dichroic is a smooth glass that changes texture when fired in a glass fusing kiln. Unlike normal dichroic, which apart from the textured styles, will be smooth after firing. 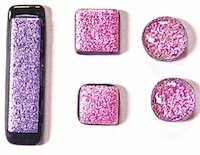 This textured dichroic made by CBS can be used on its own or used with smooth dichroic pieces in glass jewelry designs. Kiln fired hot at about 1475 F or higher the coating will push upwards and crystallize. According to the maker this results in thousands of crystalline-like mirrors attracting light and sending it out in all directions. Subject to the style chosen and the glass fusing temperature various degrees of texture change will occur. As seen from the photo below the surface is only moderately changed. This change is much greater with other colors and styles. This glass has an extremely thick crystal layer which is the secret to the crinkle style. It can be fired exposed or with a clear cap to produce a crinkled finish with brightly flashing crystals. Available on smooth or textured glass the end result will vary subject to the base glass used by the maker. You will find that this works best with solid dichroic colors rather than textured sheet. The glass can be purchased as separate sheets or in special mixed packs. It is somewhat more expensive in comparison to ordinary dichroic. Austin Thin Films has a product called DichroMagic which when fired produces a crazed pattern in the glass depending on the color, glass texture, glass thickness, coating color, and fusing technique. This produces a very unique look and finish to your kiln formed glass art. Both of these brands will produce great fused art glass jewelry.